Our regular contributor Mark Dawber (New Zealand) is trying to identify the vehicle posted on Facebook page. It is an Enfield, but what date. Location is Cambridge, in Waikato, North Island. -- Distinctive badge of a sideways cannon as used by Royal Enfield bicycles and Motorcycles. This type of radiator shape was used for only a short period on the cca 1907 Enfield Tourer which came in 15HP and a 25HP version. Soon after in 1908, Enfield was taken over by Alldays & Onions as Enfield-Alldays. 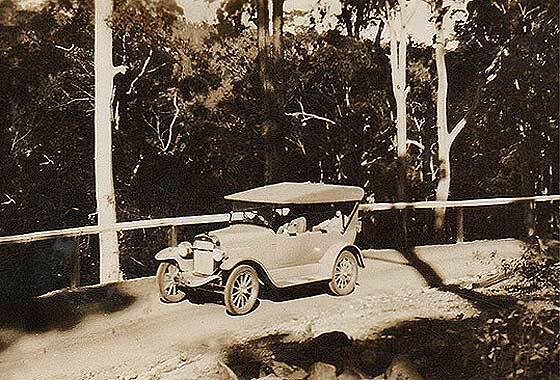 Our regular contributor Mark Dawber (New Zealand) is trying to identify the vehicles posted on New Zealand Facebook page of a Mr William Dalziel and family of Marlborough and their 1908 Alldays and Onions. -- Alldays and Onions were a Birmingham engineering/motorcycle company that went into cars in 1898. 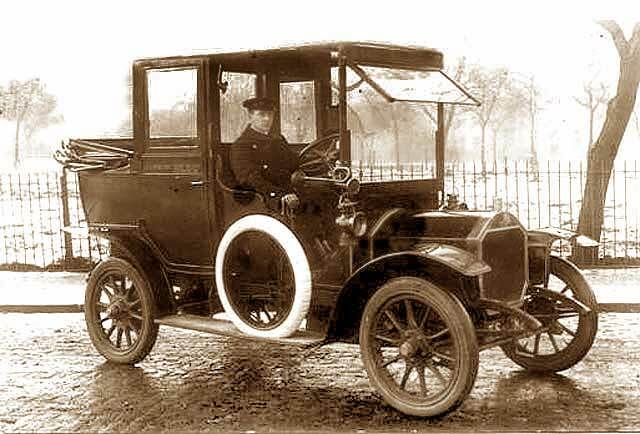 This one has seven louvres on the forward part of bonnet so is middle size model, mainstay 1906 to 1913, a cca 1907 Alldays & Onions 10'12 Tourer. Became Enfield-Allday 1908. Our regular contributor Mark Dawber (New Zealand) is trying to identify the vehicle posted on a Facebook page. 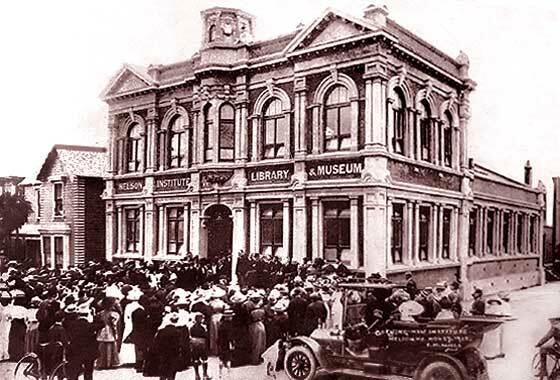 Taken in Nelson at opening of new library in Hardy St, 1912. Several Nelson streets relate to Admiral Nelson and Battle of Trafalgar. Wolseley Siddeley? 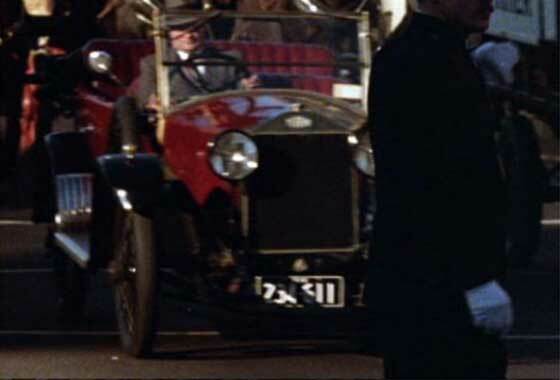 -- Small indistinct photo so difficult to be sure but has right bonnet, right bonnet handle, flush upright windscreen, and 12 spoke wheels suggesting the popular cca 1910 Wolseley Siddeley 16'20. Seems body is an open drive Landau. While researching we chanced on previously helped EdinPhoto website where two photos entitled John Menzies Cars had been posted by Kim Traynor (UK). One was a Siddeley Deasy. This one ?. -- Forward track rod so couple experts agree this is cca 1910 Napier 15 HP Landaulette. 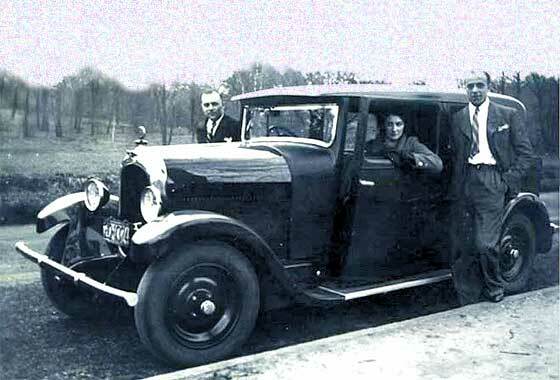 This size of vehicle was Napiers' most popular smaller model and was a popular fleet taxi in London introduced by W&G Du Cross. 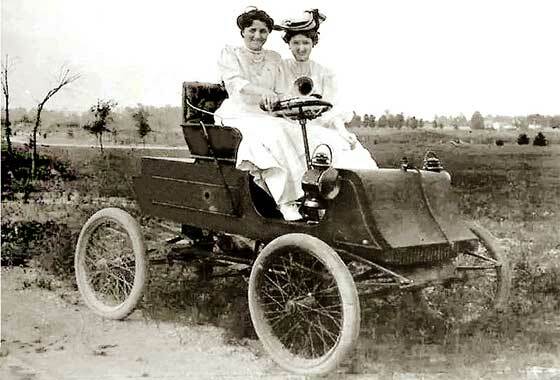 The 15HP was available in numerous body styles and was manufactured 1909 to 1914. Our regular contributor Mark Dawber (New Zealand) is trying to identify this vehicle posted on a Facebook page. 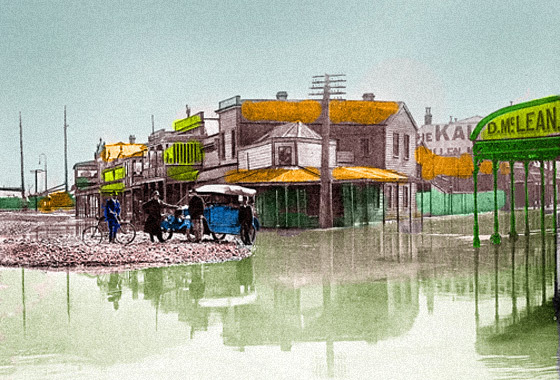 Photo is of Floods in Greymouth 14 December 1914. Vauxhall or Siddeley-Deasy, or ?? -- Hand coloured photo but far too little detail visible to be absolutely sure. Looks a sloping bullnosey type rad with filler cap. Does not look British. My thoughts were Mellaurgique or early Chevrolet. We have had previous Metalulurgiques there, so this may be a smaller cca 1912 12CV. 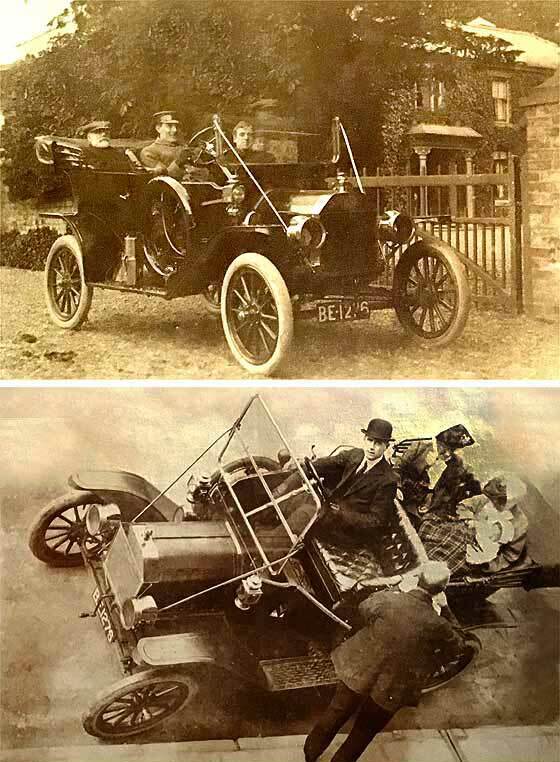 Two photos received from Helen Hayton (UK) of her great great grandfather Dr Thomas S. Morley of Barton upon Humber, Lincolnshire, 1885-1921; in back seat top photo, front passenger seat and his chauffeur driving bottom. 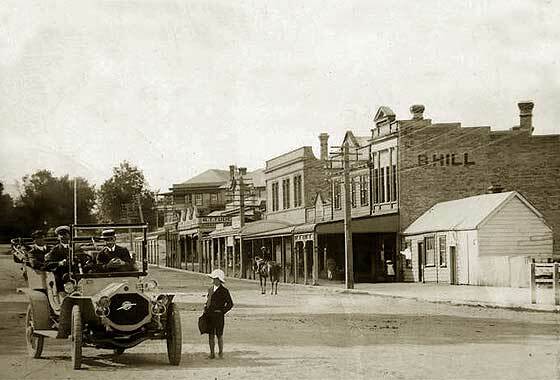 -- Either two identical cars, or it is the same car but with registrations 52 apart, Lindsey Council, 1912. Car/s are, from ribbed billed mudguards, no drivers door etc. correct for a cca 1912 Ford Model T Touring. Perhaps a 'corrected' registration error ?? Another interesting photograph well worth sharing on our Help Pages as a vehicle identification aid to automobile historians, found while surfing the web researching unknown machinery. Can we name make? -- Made in Prague Czechoslovakia by a company that was started in 1907 by Ceskomoravská Továrna Na Stroje who took out a licence from Isotta-Fraschini. This car was own design being a cca 1913 Praga Grand Tourer, sold widely to Austro-Hungarian forces as staff cars, 335 made. While researching we chanced on previously helped EdinPhoto website where two photos entitled John Menzies Cars had been posted by Kim Traynor (UK). Suggested this may be Siddeley Deasy? -- Indeed a cca 1913 Siddeley Deasy 18'24 Landaulette open drive limousine with Edinburgh registration S 2673, but no data available for accurate dating. Gas main-beams, electric side-lamps, shortish bonnet so likely 4 cylinder 3,300cc. Company became Armstrong Siddeley 1919 to 1960. 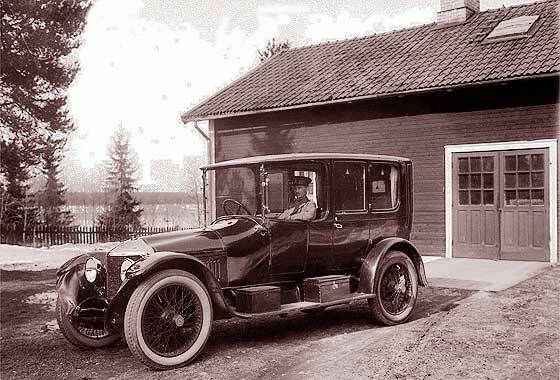 Lovely photo received from our friend Leif Holmberg (Sweden) asking if this was a Vauxhall? -- The 1913 Prince Henry Vauxhall did have a 'bullnosey' sort of radiator but with quite distinct flutes; this is quite different. Sorry wrong country. Not British but Belgian! 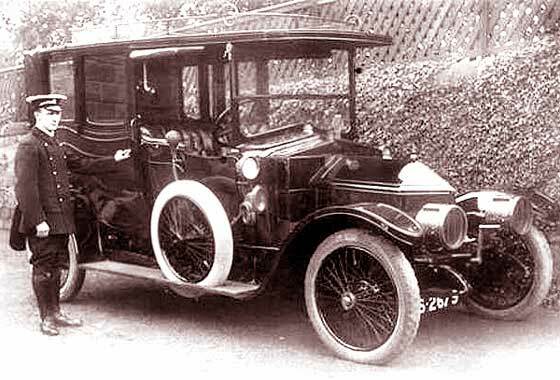 This is cca 1914 Minerva KK Open Drive Limousine (Coupe de Ville), which had this type of radiator for only a short time, so not very common. It seems it was available with 14'18'26'38 horsepower Knight sleeve valve engines. Our regular contributor Mark Dawber (New Zealand) is trying to identify this vehicle posted on a Facebook page. 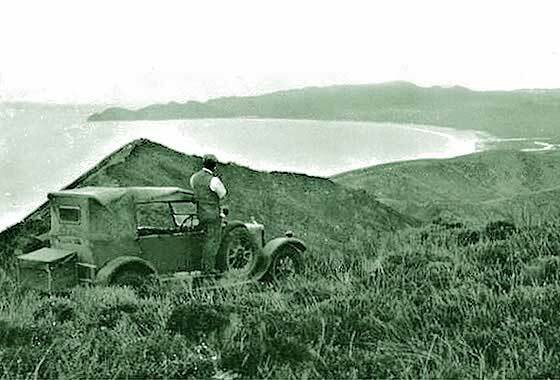 Taken in Spirits Bay, far north of New Zealand, in the 1930s. Standard SLO? 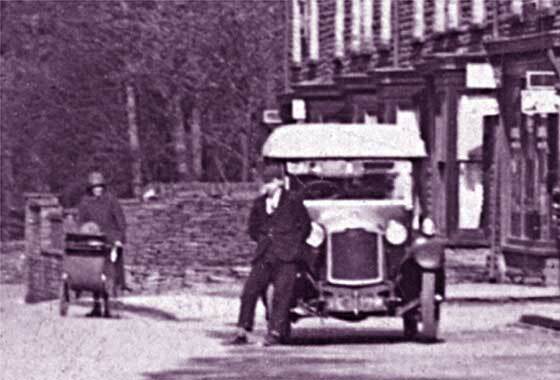 -- Small indistinct photo so difficult to be absolutely sure but with rounded peaked radiator, flat bonnet, with the radiator matrix going round the sides, no front brakes, and seemingly no front driver's door, it is likely a cca 1923 Standard 13.9 SLO4 Tourer, the 2L version of the 1600 SLO 11.6 (O for overhead). Our regular contributor Mark Dawber (New Zealand) is trying to identify the vehicle posted on Facebook page. 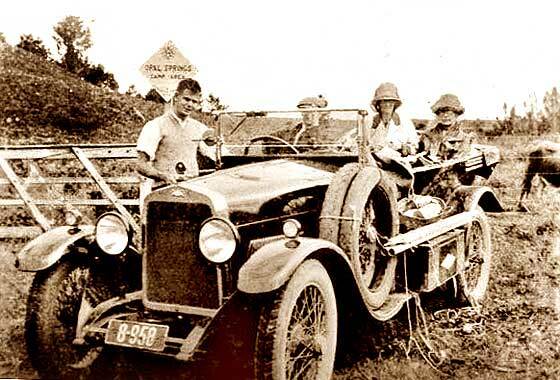 Taken 1929 and looks like a Delage DR70 maybe? -- It seems to have a tapering radiator, wider at the bottom rather than parallel, and seems to have an angular rather than oval badge. 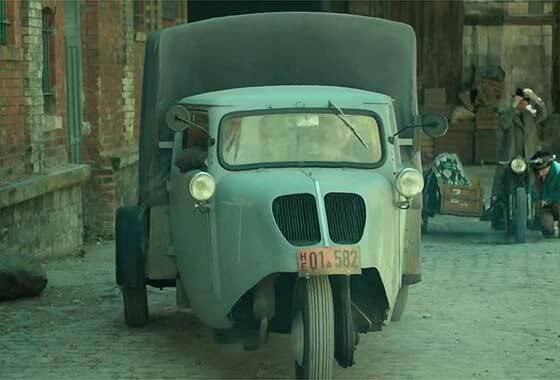 My money is on it being Italian rather than French and it being made by an armaments manufacturer in cars only 1921-31, a cca 1924 Ansaldo 4D Torpedo hidden by lots of obscuring camping gear. Very damaged period photo sent by Marion to Rootschat Forum (UK) asking for repair, and for dating and identification of car. Photo may have been taken in Australia. No identification made so far. -- Most British made cars had the sidelight on the mudguard; most American cars had them for a while on the scuttle by the windscreen. 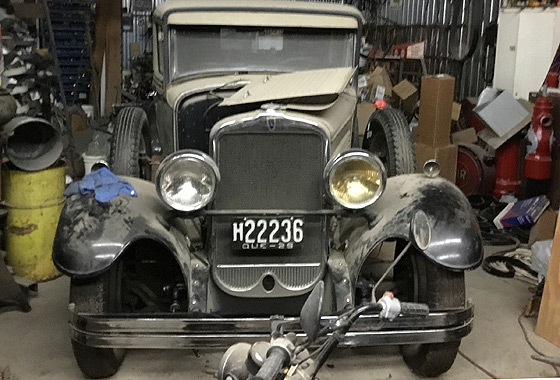 As not much of the car can be seen it is a little difficult to be very precise on model but looks like an American cca 1924 Buick Model 35 Four Door Touring. 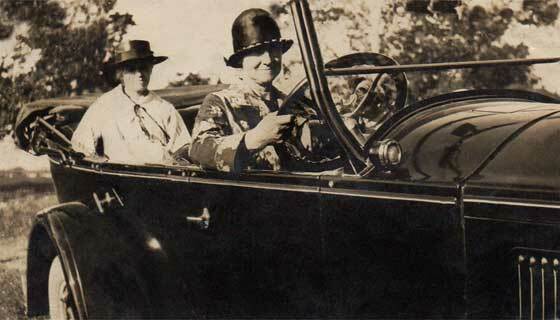 Interesting period photo sent by Marion to Rootschat Forum (UK) asking for dating and identification of car. Photo may have been taken in Australia. No identification made so far. -- First indication to origin of the car is the headlamps, drum type, and wheels, wooden spokes, normally indicating America. Specific indicator is the enclosed skirt below the radiator which indicates Overland. No exterior door handles and high headlamp bar indicates a cca 1924 Overland Model 91 Touring. Cinema screen grab taken from an Australian film "Squizzy Taylor" from 1982 where cars are being investigated by IMCDB. The film is about a small-time hoodlum Squizzy Taylor who rises to prominence and popularity in Melbourne, Australia in 1920's. -- The car is British, made by a Wolverhampton company founded in 1907, becoming Rootes in 1934 and name dying out only in 1981. Pic is bit dark but seems to have slight rounded rad bottom so is a cca 1924 Sunbeam 14'40 Tourer. Enlarged section of a bigger photo taken in South Wales, UK, sent to us by Chris Lewis (UK). The information is needed to work out approximate date of this old photograph. -- Indistinct photo, little detail visible, cannot make out the registration so it is not possible to date it accurately. Radiator is relatively wide, the sidelamps relatively large, scuttle is rounded, and car is earlier medium size, many models, so most probably cca 1925 Rover Tourer, a 14'45 or larger engined 16'60. Cinema screen grab taken from an Australian film "Squizzy Taylor" from 1982 where cars are being investigated by IMCDB. The film is about a small-time hoodlum Squizzy Taylor who rises to prominence and popularity in Melbourne, Australia in 1920's. -- Not a big car with smallish wheels and Italian flavour. Picture is very dark and indistinct but the the badge is oval with large lettering and the headlamps are on stalks. This looks like a cca 1925 Ceirano 14HP Torpedo, possibly S150. 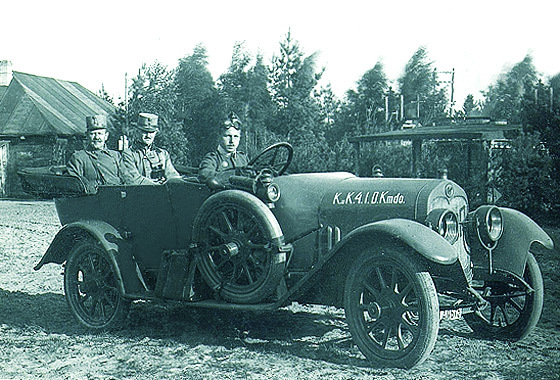 Another puzzling photo received from from Georges Truffaut (Belgium) of a vehicle he is trying to identify. "Do you have any idea of the brand of the car in the picture coming from France. -- Distinctive oval radiator with winged badge is a feature of the French Paris based manufacturer Chenard-Walcker who were the first ever winner of the Le Mans 24 hour in 1923. This is from only a few years later being a fabric covered cca 1928 Chenard Walcker 10CV Conduite Interieure. Our regular contributor Mark Dawber (New Zealand) is trying to identify this vehicle which he thinks may be an Italian Fiat 519 or 525. -- We have our doubts it is either. This was quite a poular 'look' for a big car at the time and many manufacturers had a version including Fiat, NSU ets. From details such as knock-on hubs, side and head lights, couple of screws above the rear kick plate, squarish back etc, this is an early cca 1929 Mercedes Benz 460 Nurburg W08 Limousine, possibly a Pullman. Lovely photo received from Larry Gardner (Canada) saying this car is in a barn abut 40 miles for Montreal, Quebec, Canada. Owner has no idea of the model. Thought it could be identified by front grill. -- Humpy type of radiator top not in out system so got help from our Americans expert Mark Dawber who presumed 1929, as per the plate, and it is a Peerless. 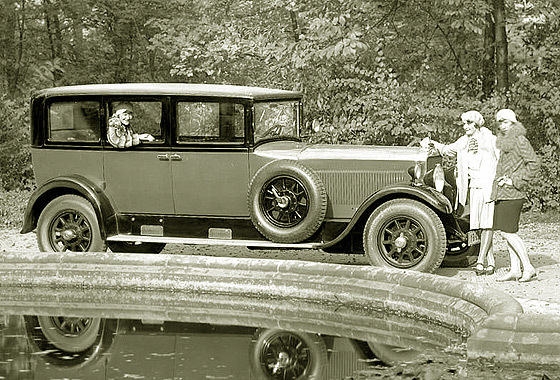 Peerless did some lower price cars near the end of their time and this looks like their lowest price model, cca 1929 Peerless Mod. 6-61 Sedan. Our regular contributor Mark Dawber (New Zealand) is trying to identify the vehicle posted on Facebook page. Seems a public works department truck. 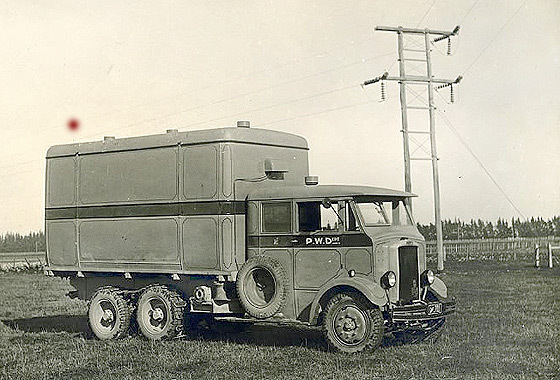 -- This is a cca 1934 Leyland Cub Mobile Workshop Truck from the K Series built at Leyland's Ham factory between 1931 and 1939 (not to be confused with the later CU series busses built 1979-1987). Subsequent research suggests this one seems to have been used in New Zealand on the Mangahao Electric Power Scheme near town of Shannon. Cinema screen grab taken from a German film "Es war einmal in Deutschland" (Bye Bye Germany) made in 2017 where cars are being investigated by IMCDB. The film is about one of a group of holocaust survivors wish to go to America but being deprived of savings overtaken by shady past. -- Commercial three-wheeler built by Vihal & Sohn of Hamburg, founded 1924. This one is a cca 1936 Tempo Model D, available with 200 or 400cc engines. 1977 purchased by Daimler Benz. 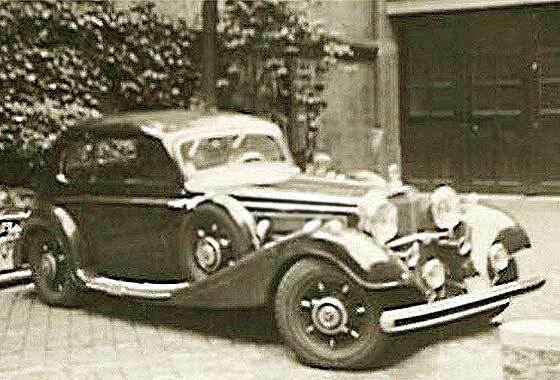 Another grainy photo received from from Georges Truffaut (Belgium) of a car he is trying to identify. 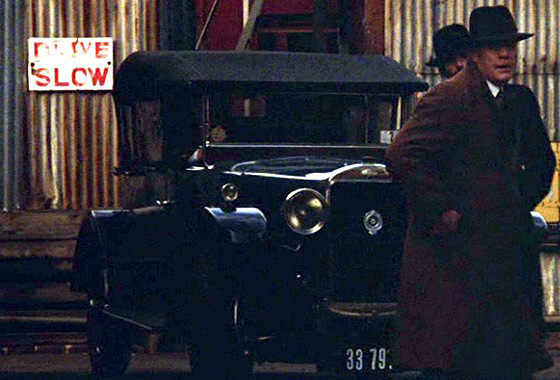 "Do you have any idea of the brand of the car in the picture coming from France. -- Distinctive radiator and exposed exhaust pipes coming out of the side of a twin louvred bonnet, and body being a two door closed coupe. Has to be a cca 1937 Mercedes Benz 540K Sport Saloon. Development of the 500 with supercharged straight 8, 5.4L. Only 406 cars made 1936-39. Recent sale UK £530,000. Our regular contributor Mark Dawber (New Zealand) is trying to identify vehicle posted on Facebook. -- Puzzling photo which seems to depict a steam car very similar to a cca 1902 Locomobile Stanhope B, but which has a hole in the rear side of the bodywork which is consistent with starting a petrol car. Our Ariejan Bos thinks this may be later conversion from steam to petrol as the 'steam ware' is not visible. The petrol tank / overflow pipe seems built into the front part of the body. 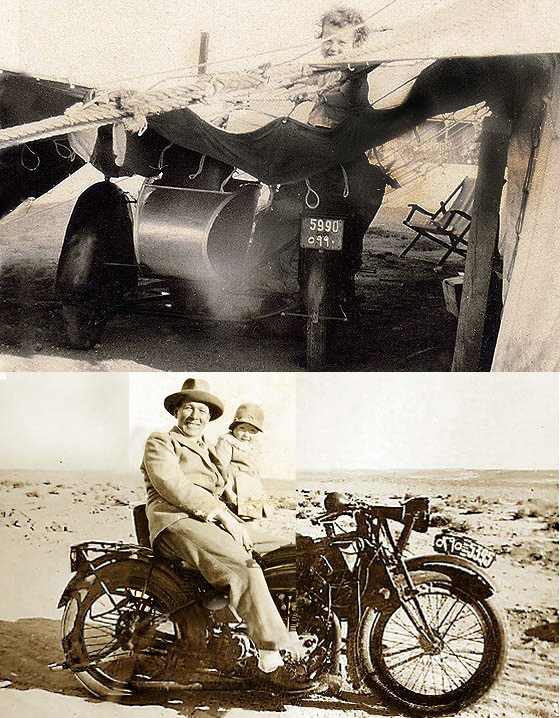 Last year we received couple of photos from Egypt relating to the Great Grandfather of Simon Burgess (UK) who was based in Egypt between 1921 and 1930. -- Our vintage motorcycle sleuth Chas Moody identified that motorcycle as a cca 1926 Rudge-Whitworth 500cc OHV. 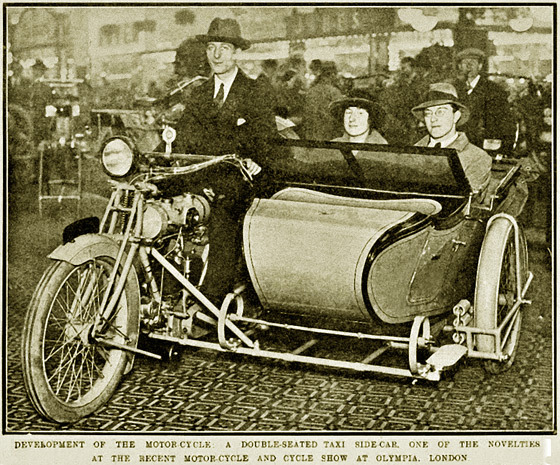 This picture is far too small, and from the back, to pull out any details, but as it has a different (later) registration it is probably a different machine, with exhaust smoke showing, and with a different more sporty sidecar. Our regular contributor Mark Dawber (New Zealand) is trying to identify the interesting Unknown Two-Seater Sidecar Combination Taxi posted on Facebook. -- Interesting photo which advises it was taken at a 'recent' London Olympia Motor Cycle Show, but is undated. Motorcycle looks British. Our Chas Moody has gone through all his books and says BAT and NUT both had round tanks, twin cylinder engines, and look a bit alike. BAT also made sidecars! Electric lights mid 1920s? HELP PLEASE!